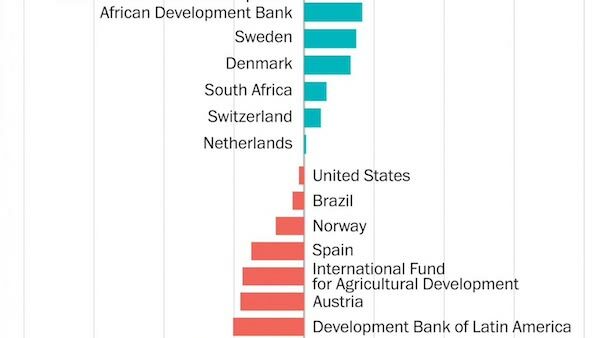 In "Sometimes it's not enough to give poor countries lots of foreign aid, study finds", The Washington Post's Adam Taylor reviews the major findings of AidData's report on "Listening to Leaders: Which Development Partners Do They Prefer and Why? "This report is based on our survey of 6,750 policymakers and practicitioners in 126 countries. Included in the article is a Value-for-Money Index ranking donors' influence on the policy priorities of their developing country counterparts, after accounting for different levels of aid spending. AidData's Executive Director, Brad Parks, was interviewed on background and is quoted in the story.